It’s no secret that Nintendo has been having significant struggles with the Wii U. The original Wii sold like gangbusters, absolutely trouncing its competition with over 100 million worldwide sales. Unfortunately, Nintendo had an issue clearly marketing the Wii’s follow-up, as many consumers thought (and still think) it was only an upgrade to the original Wii, not an entirely new system. Barring its terrible name and reputation, the Wii U has actually managed to build a solid stable of titles, with enough fantastic games available to justify the purchase of the console. Its overall library still doesn’t have great depth, even now in its 3rd year on the market, but the following 10 games are must-haves for anyone looking to buy, or who already owns, a Nintendo Wii U. The only exclusive game not be developed or published by Nintendo included on this list (which, as usual for a Nintendo console, speaks volumes about how poor the Wii U’s 3rd party support is), ZombiU was the best game available for the system when it launched in November 2012. The survival horror game, developed by Ubisoft , made fantastic use of the then-novel Wii U GamePad, and it remains one of the best showcases for the oft-ignored tablet controller’s capabilities. The GamePad can be held up and used as a vital in-game scanner, and also becomes a crucial second screen used in combination with players’ televisions. It’s difficult to find unique games with mature content on the Wii U, but luckily ZombiU fills that niche nicely. It came as a blow to both Nintendo fans and early adopters of the Wii U when it was announced that Rayman Legends, previously an exclusive 3rd party title developed by Ubisoft, would be ported over to pretty much all of Nintendo’s competitors’ systems. Ubisoft’s seeming betrayal may still sting, but the Wii U received arguably the best version of an already fantastic game, thanks to the game’s implementation of GamePad support (although the PS4 and Xbox One editions look better graphically). Rayman Legends is simply a superbly designed 2D platformer with a beautiful cartoon aesthetic that feels like a perfect fit on a Nintendo console. The difficulty gets a little too steep in later levels, but Ubisoft has designed such a satisfying gameplay experience that you may find yourself throwing yourself at the same level 50+ times in a row and not really minding. A collaborative effort between Nintendo and Koei Tecmo, which mashes together the Companies’ Legend of Zelda and Dynasty Warriors series, respectively, Hyrule Warriors is not a game that will appeal to everyone. A 3rd person action game with hack and slash combat, some may find the game repetitive or tedious. Those that like this style of game though will find one of the best in the genre with Hyrule Warriors. The Zelda universe translates well into the Warriors-style gameplay, and there is a deep progression system, with a staggering number of stages, characters, and items to unlock. Hyrule Warriors is a breath of fresh air in an era where publishers try to withhold content in order to sell it to consumers later. A sequel to the franchise-reviving Donkey Kong Country Returns on the Wii and 3DS, Tropical Freeze’s initial announcement in June 2013 was surprisingly met with negativity from some Nintendo fans, who had been hoping that the developer, Retro Studios, would return to their Metroid Prime series with their next game. Regardless of whether Nintendo and Retro made the right decision, Tropical Freeze still turned out really well and is easily one of the Wii U’s best games. It doesn’t stray very far from the concepts outline in DKCR, but that’s not necessarily a bad thing. Tropical Freeze is well-designed platforming goodness, and the game rounds out the Wii U’s library nicely, even if it doesn’t do anything really new. Arguably the biggest surprise in the Wii U’s library is Bayonetta 2, a game whose predecessor never even appeared on a Nintendo console! Although it has niche appeal, Bayonetta 2 is representative of the kind of 3rd party games Nintendo needs to attract to their systems in order to remain competitive. It also helps that Bayonetta 2 is a really good game. Developed by highly regarded developer Platinum Games, Bayonetta 2 is a 3rd person action game that puts players in control of the titular heroine, a witch who uses firearms and magic to combat angelic enemies (yes, really). The game’s main draw is its deep, intricate combat, as well as its over the top level and enemy design (for a good indication of this game’s absurdity — one fight takes place on top of a harrier jet). Nintendo has usually shied away from having mature rated games like Bayonetta 2 on its consoles, but Wii U owners should consider themselves privileged to have such a great game all to themselves. The Pikmin series, first introduced in the early 2000s on the Gamecube, has never been one of Nintendo’s most popular, but the long in-development 3rd entry was welcomed with open arms in Summer 2013 when the Wii U was really hurting for software. Since that time, the Wii U has had a number of high profile releases that have helped bolster its library, yet Pikmin 3 is so good, it still deserves consideration as one of the Wii U’s best. Players command an army of cute alien plants called Pikmin in order to carry out various tasks and solve challenges on an alien world. It’s best described as a real-time strategy game, and the great thing is that Pikmin is still such a young series that its gameplay still feels fresh. Newcomers shouldn’t be intimidated by the “3” in the title, as it can definitely be enjoyed without any prior knowledge of the franchise. HD remakes came into vogue on the last generation of consoles and are here to stay, if the frequent remasters of old games on Sony’s PS4 and Microsoft’s Xbox One are any indication. Nintendo has been nowhere near as remake-happy as its competitors, but the ones they have done have been really strong and worthwhile. The best so far has been the much-celebrated HD remake of The Legend of Zelda: The Wind Waker, which is a highly beloved entry in the series, originally released on the GameCube in 2003. The HD remaster came out in Fall 2013 to rave reviews, thanks in large part to the beautiful upgraded graphics and some key fixes that addressed a tedious quest later in the game, making an already undisputed classic even better. The release of a new Mario game on a Nintendo console used to be a major event, but ever since the days of the Wii, Nintendo has diluted the series by releasing too many titles. Instead of one traditional Mario game a generation, there now seems to be one every other year. However, Nintendo stumbled onto something with Super Mario 3D Land on the 3DS in 2011, which received positive reviews for its interesting mix of 2D and 3D design philosophies. Nintendo then proceeded to knock it out of the park with the Wii U sequel, which not only took everything great about its predecessor and put it on a bigger screen, but somehow produced a love letter to the franchise in the process. Everything from the level design, music, and visuals represents Nintendo at its best, and the 4 player gameplay not only works, but makes the game better. 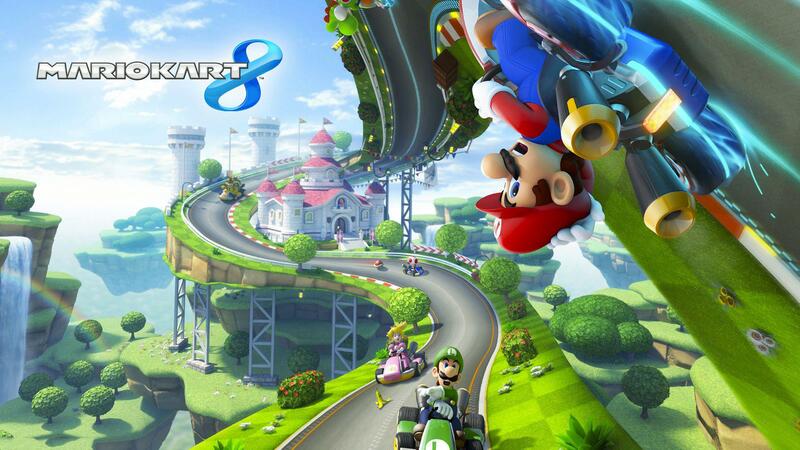 It’s really a toss-up between this game and Mario Kart 8 for the number 1 game on Wii U. While the latter game arguably edges out the former by a slight degree, Super Smash Bros. is still so good it’s worth buying a Wii U just to play it. The 4th overall entry in the popular series, this iteration of the Nintendo mascot fighter did something interesting by releasing on both Nintendo’s handheld 3DS platform and the Wii U in the Fall of 2014. While the 3DS version is excellent in its own right, the true Smash Bros. experience is on the Wii U, where it not only shines as a deep fighting game, but is possibly the best form of fan service Nintendo has ever released. Depending on who you ask, it’s not only the best entry in the series (no small feat considering the deep affection fans have for 2001’s Melee), but the best game on Wii U as well. As the title makes clear, this is the 8th entry in the long-running Mario Kart series. After so many entries, you would think the series would start to get stale and fail to deliver a compelling experience. Fortunately for both fans and Nintendo, the team behind Mario Kart 8 stepped up, creating a feature-rich entry that stands among the series’ best. At this point, it’s hard to introduce any ideas that could be deemed revolutionary in the Mario Kart series, but 8 makes up for a lack of innovation by simply being fun, through and through. New anti-gravity racing, creative track designs, and the largest stable of racers in the series help build the game’s value, but those aren’t the real selling point. No, Mario Kart 8 is the best game on the Wii U because it focuses on being the best Mario Kart game possible, and succeeds in almost every way (except for the botched Battle mode…but nobody buys Mario Kart for that anyway).